A report from CNN’s Jake Tapper has reintroduced “Benghazi-Gate” to the US media spotlight. The report claims that “dozens” of CIA operatives were on the ground in Benghazi on the night of the attack, and the CIA is going to great lengths to suppress details of them and their whereabouts being released. The report alleges that the CIA is engaged in “unprecedented” attempts to stifle employee leaks, and “intimidation” to keep the secrets of Benghazi hidden, allegedly going as far as changing the names of CIA operatives and “dispersing” them around the country. Sources now tell CNN dozens of people working for the CIA were on the ground that night, and that the agency is going to great lengths to make sure whatever it was doing, remains a secret. CNN has learned the CIA is involved in what one source calls an unprecedented attempt to keep the spy agency’s Benghazi secrets from ever leaking out. Since January, some CIA operatives involved in the agency’s missions in Libya, have been subjected to frequent, even monthly polygraph examinations, according to a source with deep inside knowledge of the agency’s workings. The goal of the questioning, according to sources, is to find out if anyone is talking to the media or Congress. It is being described as pure intimidation, with the threat that any unauthorized CIA employee who leaks information could face the end of his or her career. Speculation on Capitol Hill has included the possibility the U.S. agencies operating in Benghazi were secretly helping to move surface-to-air missiles out of Libya, through Turkey, and into the hands of Syrian rebels. Although Saudi Arabia have recently been kindly given “the Syrian card” by the United States – with Prince Bandar once again becoming “Prince of the Jihad”; it has become common knowledge that since the onset of the Syrian crisis, it was Qatar at the forefront of supplying arms and funds to both the political and militant elements of the so-called “opposition”. This has undoubtedly included tacit support of the dominant radical elements among the plethora of brigades on the ground in Syria; with Jabhat al Nusra being the most obvious beneficiary of Qatari largesse. Earlier this year it was reported that the CIA had been in direct “consultation” with the Qatari Monarchys’ network of arms smugglers – run primarily from the Emir’s palace in Doha. Accordingly, it seems certain that both the CIA and Qatari intelligence were involved in an operation to ship arms stockpiles from “rebels” in Libya; to the “rebels” in Syria: both varieties of which are inextricably linked to Al Qaeda affiliates and radical Salafi-Jihadi militants. A New York Times report from 30th March 2011 reveals that the CIA had been active in Libya “for weeks”, to “gather information for [NATO] airstrikes, and to contact and ‘vet’ the rebels battling “Gaddafi’s forces”. The New York Times report also states that Obama had signed a presidential finding in the weeks previous, which gave authority to the CIA to arm and fund the rebels. Furthermore, the Independent revealed in March 2011 that Obama had requested Saudi Arabia supply arms to the Libyan militants. Obama had also given his blessing for Qatar and the United Arab Emirates to ship arms into Benghazi, urging them to supply non-US manufactured arms to avert suspicion – in violation of the No-Fly Zone and arms embargo he helped to enforce, and all in total violation of the US Constitution and International Law. The current Libyan authorities have made little effort to disassociate themselves from reports of large-scale arms shipments bound for Syria, leaving from the port of Benghazi. As stated in a UN Security Council report; the sheer size, monetary and logistical requirement to organise such delivery would almost certainly require at least some local government knowledge and assistance, one Libyan congress-member has openly admitted as such. Moreover, in a Telegraph report from November 2011, it is noted that the post-Gaddafi Libyan military commander Abdel Hakim Belhadj – widely regarded as the former leader of Al Qaeda affiliate: the Libyan Islamic Fighting Group (LIFG) and a lead figure in the militant uprising against Gaddafi – visited members of the Syrian opposition “Free Syrian Army” (FSA) in Turkey to discuss sending “money and weapons”, and also discussed “Libyan fighters to train troops”. Furthermore, an extensive UN report from the Security Council group of experts, from April 2013, also highlights the rife lawless proliferation of arms throughout Libya, and seeping beyond its borders. The report stated that arms were fueling conflicts from Syria to Mali, and arms were spreading from Libya at an “alarming rate”. Qatar and the United Arab Emirates were singled out in the UN report for blatant violations of the arms embargo during the 2011 “uprising” against Gaddafi; the report revealed that multiple Qatari arms shipments had been allowed to flow into Libya with the full knowledge and acquiescence of NATO – in much the same way they have been allowed to flow into Turkey from Qatar, with Syria being the final destination. Abdul Basit Haroun (former comander of “February 17th brigade”) says he is behind some of the biggest shipments of weapons from Libya to Syria, which he delivers on chartered flights to neighboring countries and then smuggles over the border…. A Reuters reporter was taken to an undisclosed location in Benghazi to see a container of weapons being prepared for delivery to Syria. It was stacked with boxes of ammunition, rocket launchers and various types of light and medium weapons. Haroun says he can collect weapons from around the country and arrange for them to be delivered to the Syrian rebels because of his contacts in Libya and abroad. 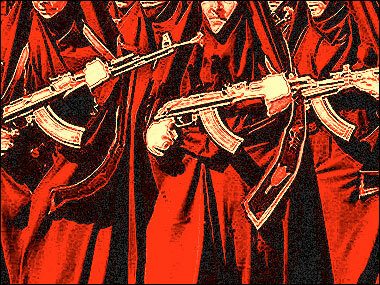 “They know we are sending guns to Syria,” Haroun said. “Everyone knows.” His weapon dealing activities appear to be well-known, at least in Libya’s east. Senior officials in Libya’s army and government told Reuters they backed supplying weapons to the Syrian opposition, while a member of Libya’s congress said Haroun was doing a great job of helping the Syrian rebels. Furthermore, according to a recent New York Times report from June 29th 2013, Qatar have been carrying out arms shipments to “rebels” in Syria from Libya, since at least the same time they “stepped up efforts” to oust Colonel Gaddafi. Consequently, this can only be interpreted as Qatar commencing shipments of arms to Syria – from Benghazi – before Gaddafi had been killed, which means before October 2011. It is highly plausible that Benghazi was indeed a CIA-run, arms “buy-back” program – with the further “possible” intent of forwarding those arms to Syria. As the State Department has confirmed, it allocated $40 million dollars for the purchase and “collection” of arms used during the conflict in Libya, including a “missing” stockpile of up to 20,000 MANPADS – which at least 15,000 are still unaccounted for. A report written by former US special forces operatives who served in Libya titled “Benghazi: the definitive report”, alleges that the “consulate” and weapons stockpile program was entirely run by John Brennan – Obama’s National Security Advisor at the time and now Director of the CIA – and outside the usual CIA chain of command with the sole purpose of “moving the stockpiled weapons to the another conflict – possibly Syria”. Furthermore, it should also be noted that several prominent US government figures (Clinton, Brennan, Patreaus, et al) were openly lobbying for that precise policy; this adds the possiblity that certain players within the government or the many factions of the Military Industrial Complex may have been acting outside of the Obama administrations specific consent – or building the logistics to fulfill such policy in the future. Thus, a possible explanation of the attack on the “consulate” – which we can now assume was a CIA operated arms cache – was the Obama administrations’ public reluctance to supply MANPADS or other specific heavy weaponry to the rebels fighting in Syria. Moreover, the authors of “Benghazi: the definitive report” claim that John Brennnan was targetting hardline Islamist militia in Libya via drone strikes and special operations, which may provide another pretext for the attack. Certain rebel factions, their regional donors, or their Libyan affiliates may have felt aggrieved and decided to act against the CIA and attempt to seize the weapons under their own volition. The Libyan weapons route to Syria has quite possibly been ongoing since Qatari (and Western) special forces and their Libyan Al Qaeda affiliated proxies took a hold of Benghazi. In turn the shipments to Syria have gradually increased as Gaddafi’s stockpiles became available and the lawless possibilities inside Libya expanded. These developments could also explain fighters of Libyan origin representing a large percentage of foreign fighters within the oppositions ranks; with a recent study finding Libyan fighters making up over twenty percent of foreign fatalities. If Qatar were indeed coordinating arms shipments from Libya to Syria during the early stages of the Syrian crisis in 2011, and the CIA have also been “consulting” the Qatari shipments and their follow-on transit points through Turkey; then the simplistic mainstream narrative and timeline of the conflict in Syria merely erupting from the suppression of peaceful protesters, and in turn spiralling into full-blown civil-war, is again brought into doubt. Uncovering the chain of events that led to the attack on the US “consulate”, and the variety of militia the US and its allies were arming in Libya; could in turn reveal the full extent of the Obama administrations’ support of extremist proxy-forces in Syria. Which may explain the administrations’ zealous attempts to stifle any debate or serious questioning of the events that surround Benghazi. This story first appeared at Global Research.